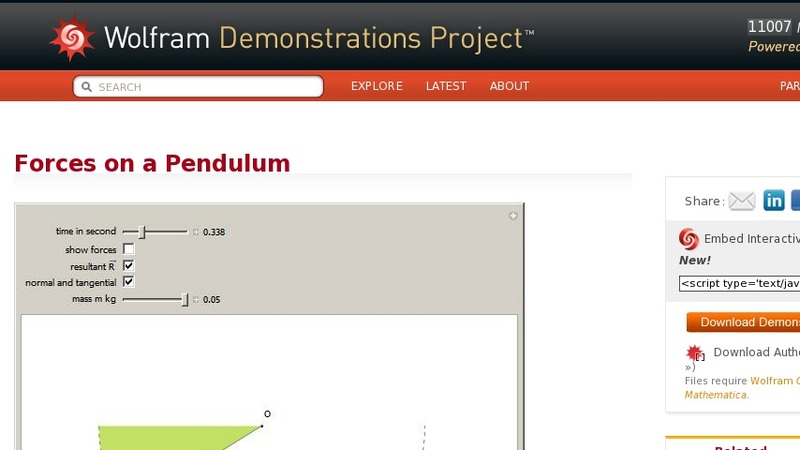 The simple pendulum is presented in all introductory physics textbooks. However, there are sometimes mistakes in the force diagrams for the motion of the pendulum perhaps due to a confusion regarding the correct relative magnitude of the forces acting on the swinging mass ... . Two forces act on this mass: the weight of the mass ... and the tension ... of the string, which is of variable magnitude. To compute the tension, we can consider the pendulum at any point and suppose it is not moving. Then the tension is equal to the normal component of the weight. If the angular velocity of the mass at this point is ... and if the mass describes an arc of a circle of radius ... , it is subjected to a centripetal force given by ... . The sum of these two forces gives the tension in the string; it is not tangent to the trajectory but rather points into the interior of the circular arc. This resultant can be decomposed into a centripetal force ... that corresponds to the curvature of the trajectory and a tangential force ... that determines the velocity of the mass.